Lavender aromatherapy pillows are made to use as is, or as either hot or cold therapy pillows. Filled with flax, lavender buds, crystallized salt, and infused with lavender essential oil, these pillows are endlessly soothing. Use your pillow to relax after a long day, relieve a headache, or even sore muscles after a rigorous workout. Each pillow is sewn with care and attention to detail and instructions for use are included. Your pillow's fabric design will be chosen for you and may vary from the pictures shown. Each Pillow is approximately 9" x 5". Each pillow will retain it's scent differently, depending on frequency of use and how many times it is heated or chilled. The included Lavender Pillow Refreshing Spray is 10ml, made with lavender essential oil, and formulated especially for use with our Lavender Aromatherapy Pillows. With continued use, your aromatherapy pillow may start to loose its signature scent. To keep your pillows smelling of fresh lavender, lightly spritz your pillow with the refreshing spray, allow it to absorb and dry fully before use. 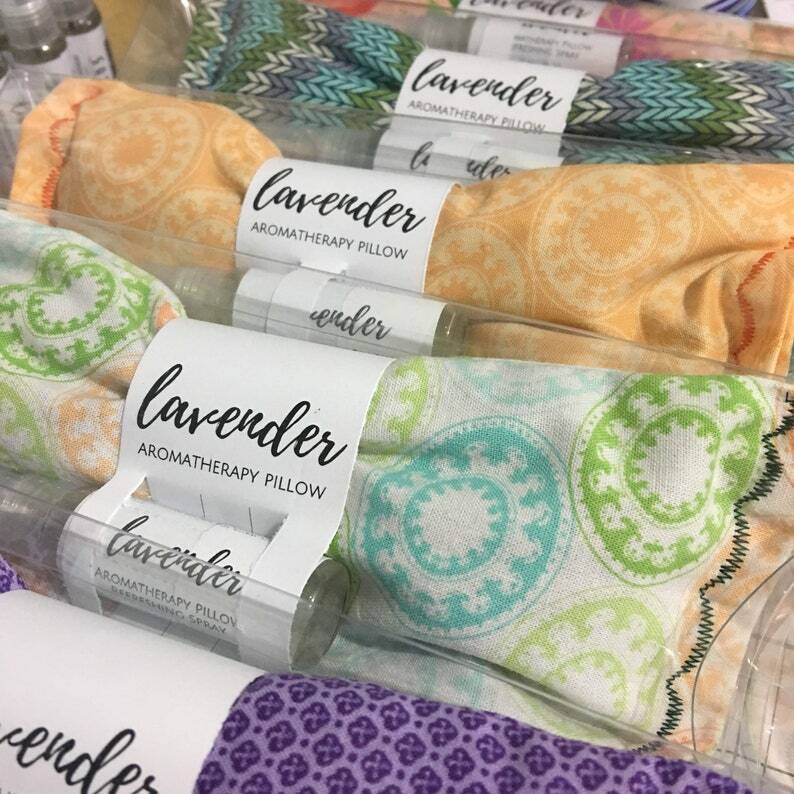 Lavender Aromatherapy Pillow Sets make great gifts for coworkers, teachers, bridesmaids, friends, and family.